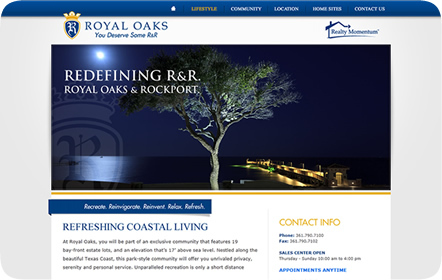 Royal Oaks is a luxury gated bay-front community ideally located in the coastal area of Rockport, Texas. Endless attractions can be found here, from visiting the beach to shopping and dining only minutes away from the community. Private piers flank the community and a putting green can be found within the spacious Royal Oaks. With grand, sweeping views of the ocean in your own private getaway, Royal Oaks is the perfect place to relax and rejuvenate. Kuper Sotheby’s International Realty needed a new website for their Royal Oaks community to exhibit their rich properties and the prime, beautiful location of the Texas Coast. 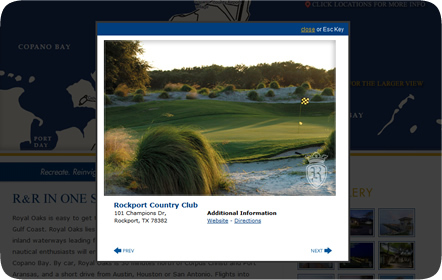 It became not just about the Royal Oaks but about encouraging people to visit Rockport. 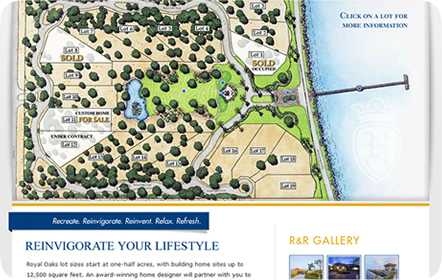 Large images of the area feature the refined elegance that Royal Oaks has to offer. We included an interactive map of the lots available for sale in the “Home Sites” page. When clicked, a small window appears with a scenic image and further information regarding lot. Other areas of the community, such as the pier, the grand entrance and the park, are also included on the map. SEO became a fundamental part of the website. Royal Oaks needed to become a well-known place not just in Texas, but in all of the United States. 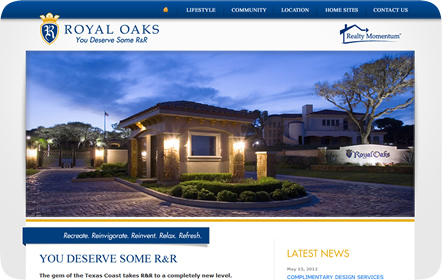 Royal Oaks can be found on the first page of Google when searching for Texas Coast real estate.